This generation, Digital Marketing is fast becoming an effective communications tool for businesses, which are constantly coming up with new ways to reach their target market to convert them into clients. Social networks allow people to collaborate and communicate at almost zero cost. So TAG Media and Public Relations will present topics for speakers to discuss important details to understand more the importance of digital marketing. 1. Set of speakers are leaders from different industries and engaged in momentous pursuits of significance to the ASEAN region. Attendees are senior business people, high-ranking government officials and media journalists. The speakers from that industries are the best from the best to give insights and to discuss different cases to improve your products and services. How to measure the Social Media success? What is Search Engine Optimization & why it’s important? How to optimize the digital customer experience in South East Asia? 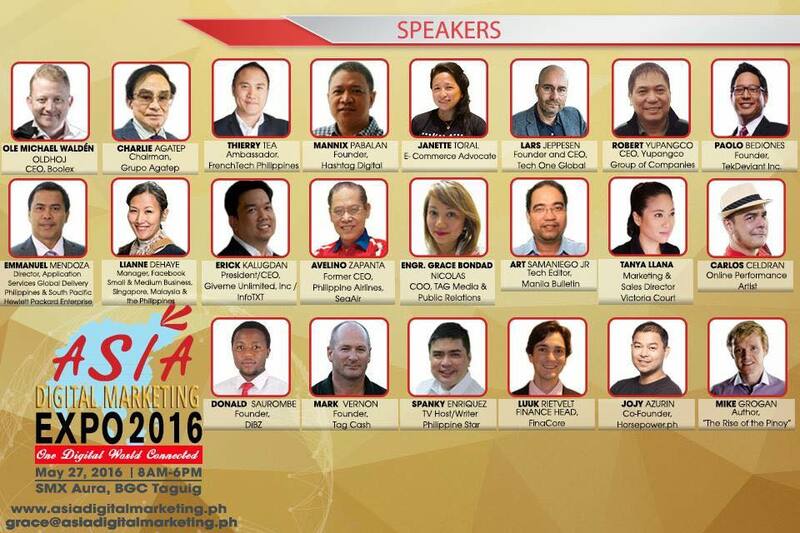 Some of the speakers last year includes Ms. Amor Maclang - Architect, Risk/Crisis/Reputation Strategist, Marketing and Communications Innovator of GeiserMaclang, and Mr. Constantin Robertz, Managing Director of Zalora. 4. We're looking for 5 Startup Innovators to pitch for 5 minutes their products or services with leaders and investors in the audience. From the last event that we had, we accepted 11 pitchers, 2 got investors already & some are negotiating already. Like last year event, now we are expecting 1000 visitors on the event with 30 Exhibitors from different industries; Hotels & Resorts, Manufacturing, Telecommunications, Tourism, Automotive, Hospitality, Business Process Outsourcing, Academe, Health, Information Technology, Food and Service to showcase their products and services and to give you gigantic discounts from their packages. The exhibition floor is FREE to all to encourage target clients to visit the booths with a “stamp card” so that each booth will be visited. With the complete stamps, the visitors can claim after their loot bag at the reception. This is to help the exhibitors to reach all participants and their target clients. 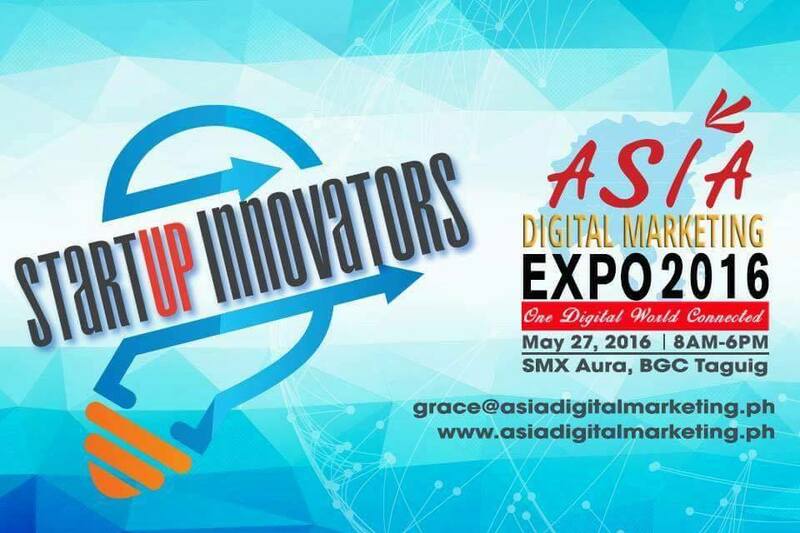 TAG Media and Public Relations is the organizer of Asia Digital Marketing Expo 2016. For more details about the event and for partnership / sponsorship, please call or text 09166299381 or send inquiries to grace@asiadigitalmarketing.ph. He also recommends using Pinterest's own search bar to get keyword thoughts:"Pinterest will indicate keywords that other people have searched ." Later in this post, we will also talk about Pinterest suggested hashtags, which can be helpful for keyword research. After all, with the kind of following Social Media has, it has well and truly become the drug of our choice. buy followers facebook for the best social media marketing of your brand..
Facebook advertisers are permitted to geo-target an audience by country which allows the advertiser the ability to limit or expand the message of their ad based on settings that are selected. you can check here right now, and promote your business.